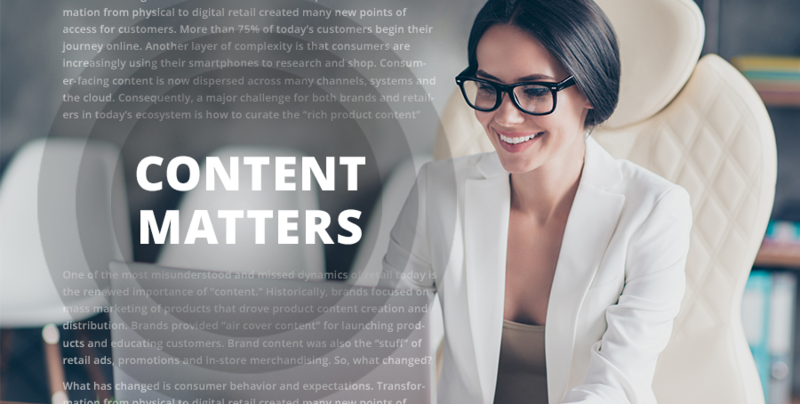 One of the most misunderstood and missed dynamics of retail today is the renewed importance of “content.” Historically, brands focused on mass marketing of products that drove product content creation and distribution. Brands provided “air cover content” for launching products and educating customers. Brand content was also the “stuff” of retail ads, promotions and in-store merchandising. So, what changed? What has changed is consumer behavior and expectations. Transformation from physical to digital retail created many new points of access for customers. More than 75% of today’s customers begin their journey online. Another layer of complexity is that consumers are increasingly using their smartphones to research and shop. Consumer-facing content is now dispersed across many channels, systems and the cloud. Consequently, a major challenge for both brands and retailers in today’s ecosystem is how to curate the “rich product content” that engages customers early, often, and even after the sale. Content is not enough. It must be consistent, portable and seamless. Since a majority of today’s customers begin their journey online, consistent content is critical for engagement. Content consistency also increases the potential to “help a customer decide to buy,” or at least make a trip to a store to experience the product in person. Today’s savvy customers expect all the details they need in order to make systematic product value comparisons, from wherever they shop. Brands and retailers actually have the same end goal of helping customers buy products that are a “best fit.” Achieving the mutual goal of profitable sales requires a shift from pure product content to consumer-centric, decision-oriented information. In addition, content must be available seamlessly and consistently anytime, everywhere, on the portal consumers choose. This new depth and breadth of content is simply beyond the reach and resources of almost all brands and retailers working in isolation. Consumers don’t purchase based upon channels. They do not distinguish between physical and digital. They expect everything to be seamless across their purchase journeys. For today’s consumers, the “e” in e-commerce means “everyday” and “everywhere.” Customer-centric content has become the interactive currency required for consumer consumption across time and place. Successfully growing consumer engagement and transactions across this omnichannel ecosystem now requires an interconnected and dynamic mix of cloud and on-premises applications to deliver the content consumers expect on their terms. Few, if any, brands and retailers have the capacity or the resources required to produce, manage and deliver the consistent, consumer-centric content required for today’s commerce. "Customer-centric content has become the interactive currency required for consumer consumption across time and place." Historically, retailers have relied on brands to produce the product images and content required for ads and web pages. As retailers scramble to deliver omnichannel solutions, they have severe resource constraints for in-house content production and content management. Even the largest e-commerce players like Amazon are stretching to cover more than 5 million SKUs that need accurate content online in a consistent format. Retailers lack their own content production and management resources. Retailers need content consistency for their brand and customer experience. They do not have time or resources to refit and repurpose each brand’s content. Retail systems were not designed for interactive and digital asset management. Retailers need resources and talent to deliver consistent, effective content across all channels where they reach consumers before, during and after the sale. 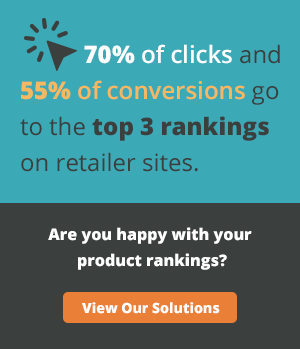 Retailers simply do not have the time, resources or systems to manage real-time content across multiple channels with escalating numbers of SKUs. "Producing content no longer guarantees success. Winners collaborate to curate content that engages customers where and how they shop." Brands will continue to be a primary source of content about their products and services. The major challenge that brands face today is the efficiency and speed of getting content dynamically placed on separate retail systems with different platforms and requirements. Brands need consistent content across their own sites, and every retailer site. Retailer legacy systems have different platforms, templates and requirements. Large retailers are carrying millions of SKUs, with delays in updating content. With large assortments, retailers are now requiring curated content and context. Product launches require speed across multiple platforms, systems and devices. Brands need content accuracy and consistency across many retailers with different systems and requirements. Speed makes or breaks product launches and sales. There are two major critical success factors in today’s retail ecosystem: inventory management and content management (CM). Distributors have become much more than “box movers.” They are now the strategic interface managing virtual and physical inventory required to meet customer demands for store stock, click and collect, and last-mile delivery to their home or office. Without distributors providing the dynamic interface role, neither brands nor retailers individually have the systems, capital or resources to deliver what the consumer has purchased when and how they want it delivered. Likewise, brands throwing content “over the wall” does not mean it gets loaded in a timely manner in retailer systems. It also does not ensure that there will be relevant, consistent content of the same quality across all customer touch points. “Passing the buck” back and forth does not achieve the content required to engage consumers and increase sales. Just as distributors now provide the intermediary role and systems for inventory management, there needs to be a similar broker with expertise, systems and resources for dynamic content management across touchpoints, platforms, clouds and devices. During the past three decades, I’ve had the opportunity and challenge of working the “seam” or interface of consumer brands and retailers. To be frank, content management has been an afterthought. No longer. It is now mission-critical for both partners to grow sales in a consumer-driven, omnichannel marketplace. I recently discovered an interesting case study from OneSpace on their collaborative role and results with Purina. Purina faces the new brand challenge of selling hundreds of products to giants like Amazon and Walmart, as well as to specialists like Petco, PetSmart, Chewy and others. All of these retailers have their own unique content templates and page requirements. Hundreds of Purina products must be updated three to four times a year across all those pages consistently. In order to optimize sales, Purina needs the same quality, consistent content in every place consumers choose to shop. OneSpace is the new “distributor” for content production, alignment and distribution. They take the friction and tension out of content management, enabling brands and retailers to work effectively and much more efficiently. In the Purina case study, OneSpace reduced time to market by 500% and overall content costs by 67%. Results count! Those results are amazing and will impact the bottom line of both the brand and retailers. Bonus: See how OneSpace helped Purina decrease time to market by 500%. Chris Petersen, PhD., is a strategic retail consultant, keynote speaker, and blogger specializing in omnichannel and retail transformation. Omnichannel is complex, difficult and very capital expensive. He helps retailers and brands optimize and achieve results by leveraging strategic insights, analyzing critical success factors and measuring the new omnichannel metrics required for success.